This healthy Instant Pot Spaghetti is a quick weeknight meal! Whole grain pasta with no sugar spaghetti sauce makes for a delicious family dinner recipe. 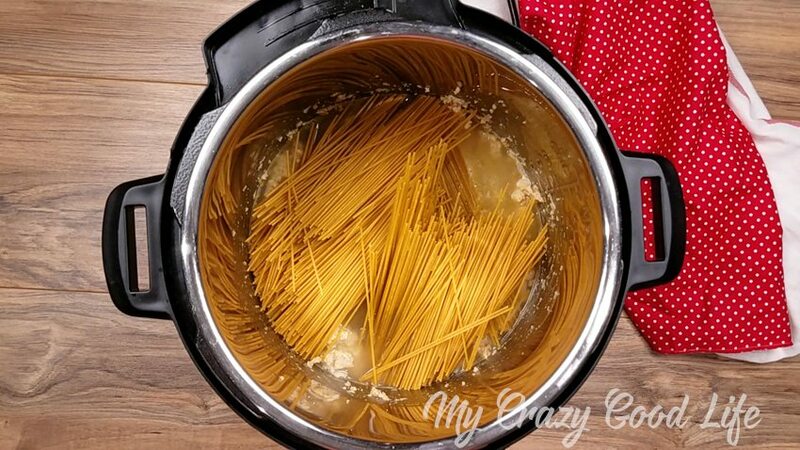 This easy Instant Pot recipe is is a family favorite, and even better it’s a clean 21 Day Fix spaghetti. One of my favorite meals growing up was spaghetti, and my boys seem to love it as much as I did. What I don’t love about spaghetti as an adult, though, is the sugar-added sauces for sale on the shelves of the grocery stores, and the amount of pots and pans it takes to make dinner! Now that there are better options out there like no sugar added sauces, super easy homemade pasta sauces, and whole wheat noodles, I don’t mind making this for my family as often as they ask for it! 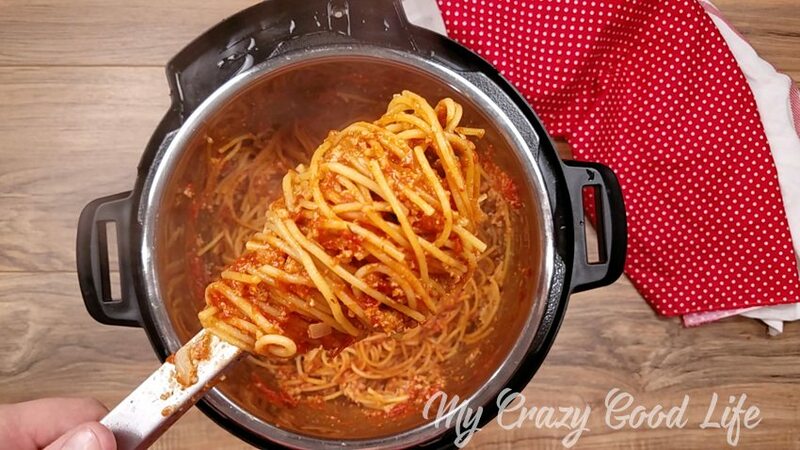 Of course, the Instant Pot makes this a crazy easy spaghetti recipe. 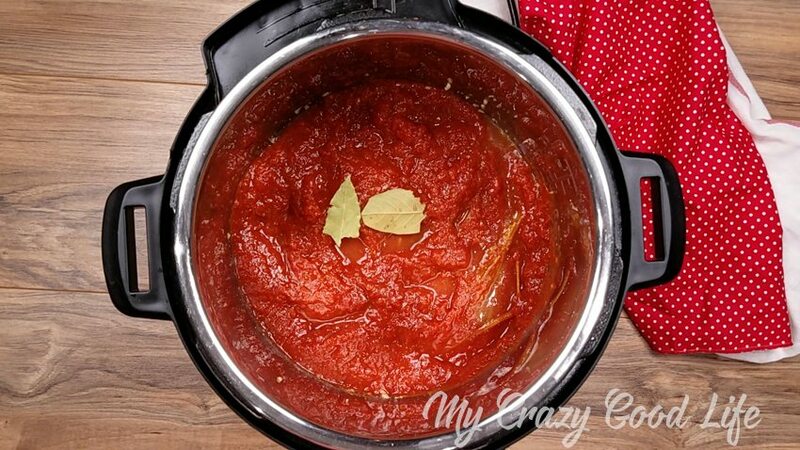 How do I find a clean sugar free spaghetti sauce? No added sugar In the ingredients section, I make sure that sugar isn’t listed as an ingredient. If you look in the nutrition information, you’re going to see that there is a value for sugar in the sauce–this is ok, because all tomatoes have natural sugar and you’re always going to see some sugar in the nutrition info. I also like to look at oils. I try to stay away from highly processed oils like soybean, canola, and corn oil. Why is this 21 Day Fix Spaghetti? 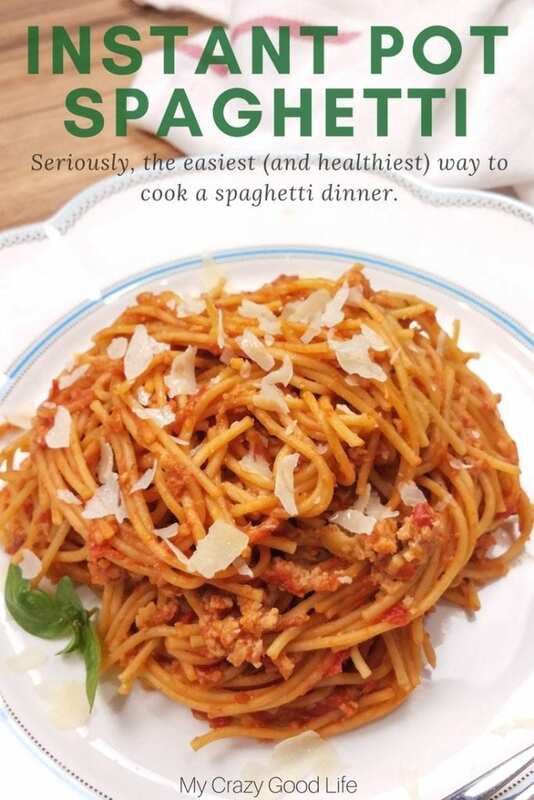 This spaghetti recipe fits perfectly into the 21 Day Fix or Portion Fix plan, as well as Weight Watchers–it’s simply a healthy spaghetti recipe. This is a Portion Fix approved recipe because it uses ground turkey instead of beef, whole wheat pasta noodles instead of white, and a sauce without added sugar. 1. In a large bowl, mix together ground turkey, salt, pepper, Italian seasoning, and onion. 2. Turn the Instant Pot to saute and add olive oil. When the Instant Pot is hot, brown the ground turkey. 3. Once the turkey is cooked, turn the Instant Pot off. Pour the chicken stock over the meat, this will prevent the meat from burning to bottom. 4. Break the whole wheat noodles to fit into the Instant Pot and lay then on top of the meat. 5. Cover the noodles with the spaghetti sauce, add the bay leaves then close the lid turning the venting valve to sealing. 6. Cook the spaghetti on high pressure using the manual function for 5 minutes (or half the time on the back of the box). 7. When done cooking, let the pressure release naturally. Remove the lid and pull out the bay leaves, and then mix up the noodles, sauce, and meat. 8. No need to strain any excess liquid. Serve hot and garnish with parmesan cheese and fresh herbs. 21 Day Fix Container Counts: Serves 6. Each serving = 1R, 1G, 2Y | For no yellows, use zoodles instead of pasta noodles and adjust your cooking time! How do I cook 21 Day Fix Spaghetti on the Stove? Note: Chicken stock is not needed with this cooking method. In a large bowl, mix together raw ground meat, seasonings, and onion. Add water to a large pot and turn on high. Covering the pot will help it to boil faster. Add oil to a large pan and cook ground meat mixture until brown. When pot of water is boiling, add pasta and cook according to package directions. When turkey is cooked, add sauce to the pan and heat thoroughly. When noodles are cooked, rinse. Make your plate and enjoy! This healthy Instant Pot Spaghetti is a quick weeknight meal! 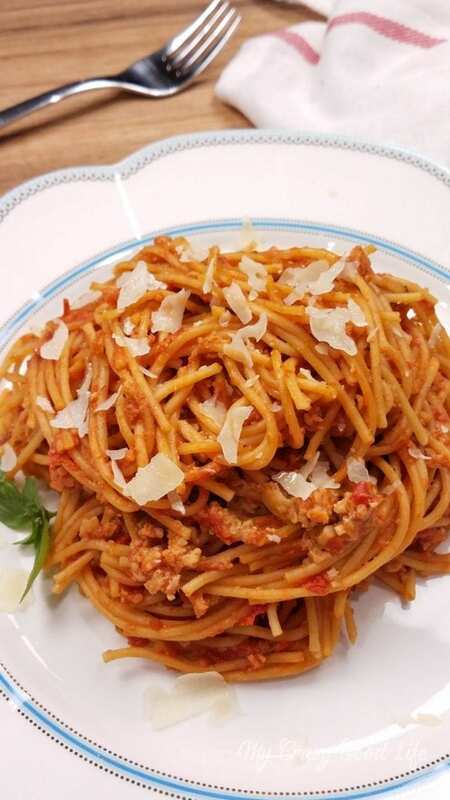 Whole grain pasta with no sugar spaghetti sauce makes for a delicious family dinner recipe. 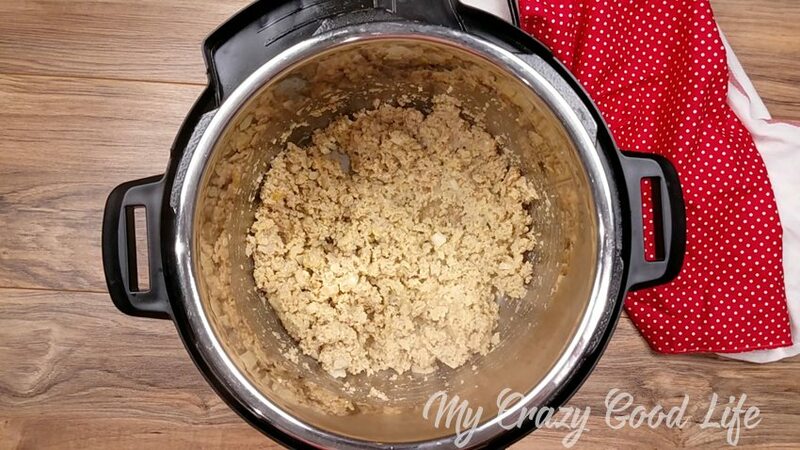 This easy Instant Pot recipe is is a family favorite. In a large bowl mix together ground turkey, salt, pepper, Italian seasoning, and onion. Turn the Instant Pot to saute and add olive oil. When the Instant Pot is hot brown the ground turkey. Once the turkey is cooked, turn the Instant Pot off. Pour the chicken stock over the meat (this will prevent the meat from burning to bottom). Break the whole wheat noodles to fit into the Instant Pot and lay then on top of the meat. Cover the noodles with the spaghetti sauce, add the bay leaves then close the lid turning the venting valve to sealing. Cook the spaghetti on high pressure using the manual function for 5 minutes (or half the time on the back of the box). When done cooking, let the pressure release naturally and remove the bay leaves. Remove the lid and mix up the noodles, sauce, and meat. No need to strain any excess liquid. Serve hot and garnish is parmesan cheese and fresh herbs. 21 Day Fix Container Counts: Serves 6. Each serving = 1R, 1G, 2Y | For no yellows, use zoodles instead of pasta noodles! What is the size of 1 serving? About 1C. I’d preportion it into 6 to make sure it’s exact.